Filleting fish is not that easy, especially if you are new to doing this task. Fortunately, you can now use an electric fillet knife to make the job easier and faster as well. Also, it’s not just about speeding up the work – you also want to prepare your food properly for quality and presentation. Since fish meat products are delicate, an efficient tool is really needed. With the right electric fillet knife, you can easily separate fish meat, skin and bones in just a matter of minutes (or even seconds, in small types of fish). All the work is, of course, made easier and faster since the filleting knife is electric-powered. Who Will Benefit from an Electrical Fillet Knife? Which is the Best Electric Fillet Knife on the Market? Ease of use – In order for a unit to be easy to use, it should be lightweight and easy to maneuver. Durable – It should be made of high quality materials to be long lasting. Workmanship is also important in a unit’s durability. Safety Lock – You and your family will feel more protected when you’re using a unit with a safety lock. Using an electrical fillet knife will save you a lot of time. You have the option of getting a model with cord or a cordless one. An electrical fillet knife is particularly helpful to people with poor grips. Although some models of electric fillet knives are capable of cutting through other types of meats, it’s not advisable to do so (it should be used according to its purpose in order to last long). In the same note, don’t use your electric fillet knife in slicing bread – get a bread slicer instead. Do you belong to any of the group of people above? Then get a good ​chef knife as soon as possible as this will make your job of filleting fish easier. If you are used to using an ordinary (manual) filleting knife, you might find that it’s quite difficult to use an electric model at first. However, when you get used to it, you will really appreciate it. In the next section, I will provide you with a Top 5 list of some of the ​butcher knives today. Compare their features and look their overall functionality and usability. And of course, the price is also an important factor in deciding which model of fillet knife to get. As for the price, however, don’t just go for the cheapest model that you can find. There are times when it’s more practical to invest on an expensive unit if it will provide you with more uses (and if it will last for a long time). In such cases, the product will pay for itself eventually. Below, I have reviewed 5 of the best electric fillet knives on the market. I know, there are lots of choices out there (which can be confusing) – consider this a shortlist of your choices. These are the best of the best, so you really can’t go wrong from choosing any of them. The Mister Twister fillet knife is a powerful unit equipped with heavy-duty bearings and gears for efficient cutting of fish meat like sushi. This particular model comes with a safety lock for your (and your children’s) protection. It also comes with a blade-release feature so that you can quickly remove the blade when it needs to be cleaned or replaced. With this tool, you can easily separate fish meats from their bones – and do so quickly as well. It has an 8-inch long blade length that can cover a wide area in 1 passing. Versatile – It can be used for different types of fish like bluegill, crappie, bass, catfish, etc. 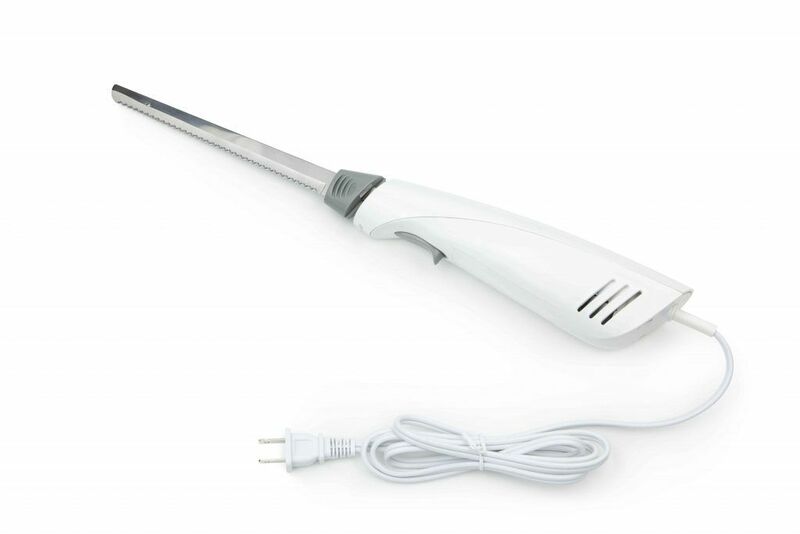 (it’s the best electric fillet knife for crappie – if you’re looking for such a knife). Safe to use – This model comes with a safety lock feature. Powerful – Its heavy-duty motor allows you to cut through fish meat quickly and easily. Easy to use – It comes with push button control and the handle grip is easy to hold on to. Affordable – This model is an affordable kitchen tool. Takes getting used to – At first, you might find it difficult to keep pressure on the right spots when filleting fish. For fish only – Although you can also use it to cut through other types of meat, it is not advisable to do so (it’s especially made for filleting fish). The Mister Twister electric fillet makes for a fine choice if you’re looking for a kitchen tool that will help you fillet fish meat. It’s really powerful and functional and can speed up your work many times over. And hey, it’s available in 2 attractive colors – green and yellow. This model is a battery-operated unit – so, it’s cordless. The fillet knife can be charged as it comes with a charger. A full charge will last for about 80 minutes – and during this time, it will stay in constant power to finish all the filleting work you have in line. Should you need to recharge it, however, it will take about 2 hours. With very sharp serrated blades, the Rapala Lithium Ion fillet knife can handle the job of filleting big types of fish. Powerful – This model can handle filleting thick meats. Fast – You can fillet a lot of fish in a short time. Easy to use – It’s easy to manipulate and control since there’s no cord that can limit your movement. Sharp blades – The serrated blades can even cut through bones. Hard to remove blades – It’s not that easy to remove the blades for cleaning. Thick handle – Holding the handle can take some getting used to. If you are specifically looking for a cordless/ rechargeable fish fillet knife, this model makes for a great choice. It’s actually reasonably priced and it will make the work of filleting fish so much easier and faster as well. And don’t forget – it works well for small and big types of fish. Made of high quality materials and heavy-duty motor, this model of electric knife from Rapala will make your fish filleting work so much easier and faster. This particular unit comes with a 7.5-inch long blade to handle all your filleting need. And with its 8’-cord, it’s easy to maneuver and move around as you use it. To operate, you simply need to press the power button and move the knife along the meat to be sliced. 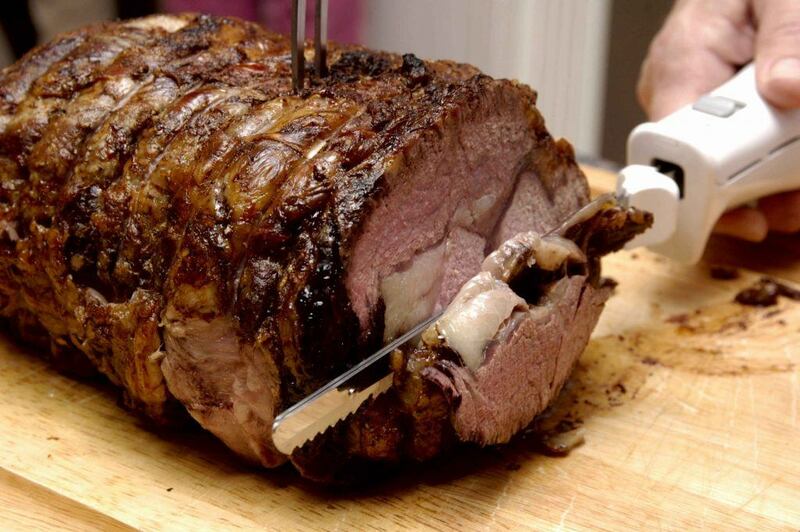 The blade will cut through meat easily without too much effort required from you. Efficient – It’s fast and effortless to use. Powerful – It cuts fast and does not overheat. Long cord – Having a long cord is really convenient when cutting through fish meat. Easy to use – Using the unit is easy on the hands and not tiring at all. Not for large types of fish – While it’s efficient in filleting small types of fish, it is not powerful enough to fillet big fish. Big handle – People with small hands might find it a bit hard to get used to the handle. All in all, this is a good type of electric fish fillet knife. However, if you plan on filleting large types of fish, this model may not be up to the task. Here’s a kit that includes a set of electric fillet knife, blades, and a glove. If you want to make sure that you have the right blade for filleting different types of fish, consider this kit. The blades included in this kit come in different forms, to accommodate filleting your fish. Since they’re equipped with airflow design, the blades won’t stick to the meat during the process of filleting. This model also comes with an 8-foot cord, so it’s really convenient to use. 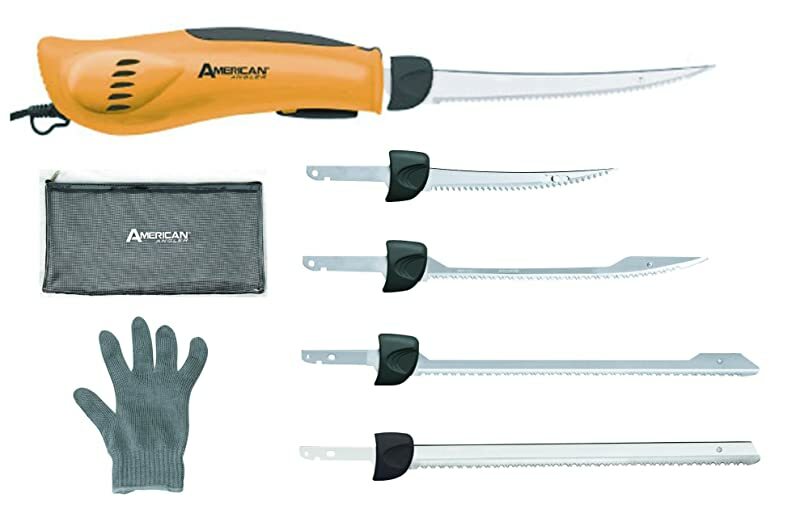 This professional series from American Angler can also be used as a commercial electric fillet knife. Functional – It can fillet different type of fish like crappies, bluegills, cat fish, etc. Complete set – This package comes with 5 different types of blade, 1 piece of glove, and a storage kit. Long cord – Its 8-foot cord makes it easy to use and manipulate when filleting fish. 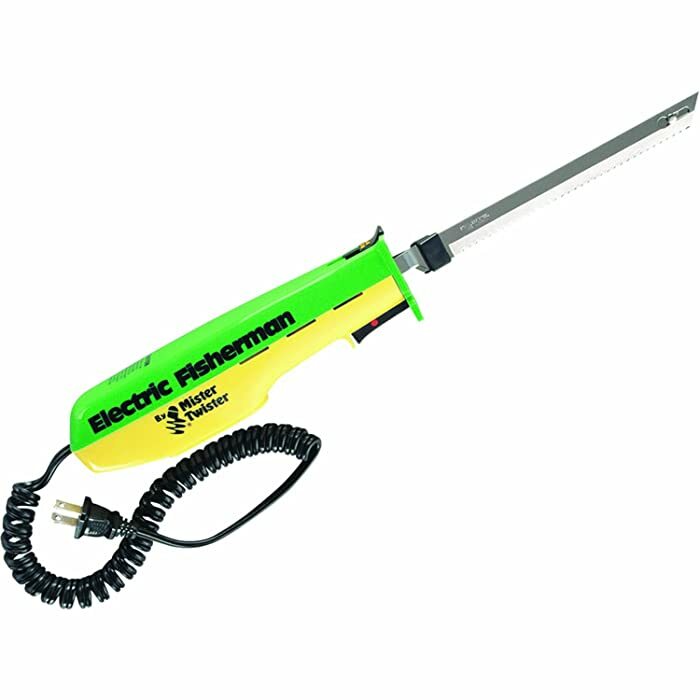 Powerful – It comes with a powerful motor to handle all kinds of filleting jobs. Sharp blades – There’s no need to apply pressure while you’re filleting fish as the sharp blades will easily cut through thick meats and skins on fish. Motor gets hot – The handle can get hot when used for some time. Handle design – It can be a bit hard to operate as the handle is quite big and bulky to hold onto. If you want a complete set of electric fillet knife, this can be one of your options. It also includes a large-sized glove to help you do the task of fileting fish easier – especially if you’re using it outdoors. This model of fillet knife is similar to the one at the Top 4. It’s not a complete kit, however, as the package only includes 1 type of blade (an 8-inch curved blade). The unit is equipped with a very powerful motor to handle all kinds of fish filleting jobs. Therefore, this model is not only for fishing enthusiasts but for commercial fishermen as well. This fillet knife is an electrical model – so, you need a power source to use it. However, it also comes with an 8-foot cord for convenience. Powerful and useful – You can use it to fillet big types of fish. Sharp tip – The sharp tip on the blade is useful in working through bones and controlling it. Easy to clean – There’s a blade eject button that quickly releases the blade when you need to clean it. 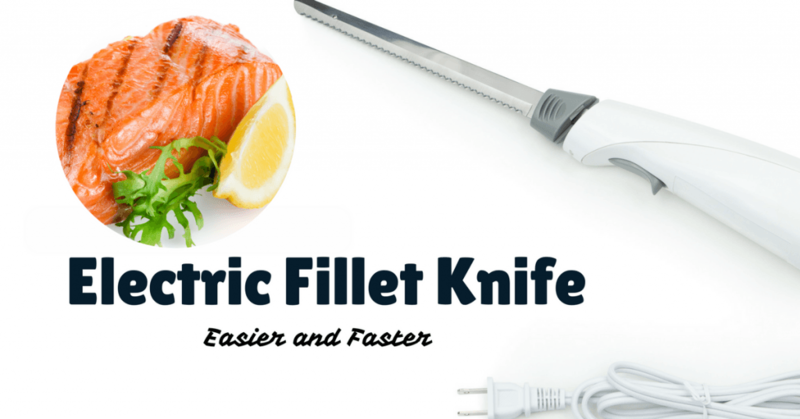 Efficient – You can quickly fillet a lot of fish with this electrical knife. Quality – This knife is well-made and sturdy. Handle gets hot – The handle can get quite hot when used for a long time. Handle can get slippery – The handle can be difficult to hold on to when cleaning fish. If you want just one piece of blade on your American Angler PRO fillet knife, this would be a good option (and not the complete kit at the Top 4 slot). Since you will only be getting one type of blade, this model is also less expensive than the full kit package. For an electric fillet knife with cord, I would suggest choosing between the Mister Twister and the Rapala Heavy Duty electric fillet knife. Both are really efficient in making clean cuts of fillet quickly. The Mister Twister model is just a little less expensive than the Rapala unit. Now, if you want a cordless fillet knife, go for the Rapala Lithium Ion fillet knife. Without a cord, it’s easier to control and manage. A fully charged battery will also last for 80 minutes – and you can already fillet a lot fish with that time, right? And should the battery be all used up, it only takes about 2 hours to fully charge again. So, just look at the Top 5 list again – you can then make an informed decision when choosing the best electric fillet knife for you. If you are looking for the regular electric knives, visit here.